There is no magic formula for discovering the optimum number of parts that can be placed on your fixture, though a few general rules apply. In essence, the optimum configuration point is a cross between the cycle time of a part and the number of parts per fixture. One must also consider that different jobs demand different part sizes that will require different work zone treatment. Several manufacturers aren’t being as productive as possible because they aren’t using their horizontal’s work zone to its fullest potential, and thus are limiting their productivity. Manufacturers clamp parts low on the Y-axis and avoid the upper portion of the fixture (even though the fixture may be large enough to accommodate more parts) because some machines aren’t as capable higher in the Y-axis’ stroke. But think of what you could achieve if you used the entire workzone as effectively as you do the bottom half, allowing you to expand your fixtures and decrease scrap rates. While some machines lose capability high in the Y-axis’ stroke, Makino manufactures its machines to be accurate and rigid throughout the full range of the Y-axis travel, no matter where the part is placed on the fixture. Manufacturers will achieve the same machining capability high on the Y-axis as they do near the surface of the pallet. With Makino machines, there is no need to waste valuable workzone space and limit manufacturing capabilities for fear of inaccurate parts. Maximizing the work zone presents several benefits. Manufacturers can increase the production capacity of each machine by more fully amortizing tool changes for multiple parts, and in many cases—especially with high-volume production—reduce the number of machines required to meet their production goals. That represents a significant savings. Scrap rates can also be reduced due to the ability to machine effectively anywhere in the work zone. Lastly, pallet cycles can be optimized, keeping machines up and running during lunch breaks and other traditional machine downtime. Maximizing the work zone isn’t as easy as packing as many parts on the fixture as possible. This approach will create only a cluttered work surface with minute clearances that interfere with tool paths. Crowded fixtures also increase the risk of damaging the part when they are loaded or unloaded. This may produce situations where operators can’t keep up with loading and unloading parts from the machine, leading to unnecessary idle time. Compromises can be made to part traceability in circumstances in which a parts’ locator cannot be determined. While optimizing part placement is one part of the solution, to truly determine how much of the work zone volume can be used effectively manufacturers need to consider their machining centers’ capabilities and mechanical considerations, part layout, pallet interface, tool holders, and tool path and speed. 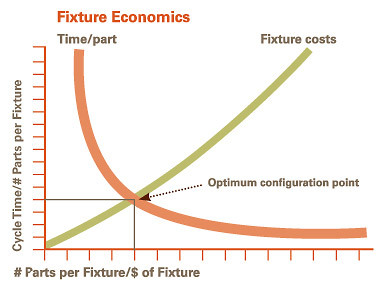 In a nutshell, every manufacturing scenario has an ideal blend of the optimal number of parts on a fixture and the fixture costs/complexities, resulting in the lowest price per part possible. Every machine has its limitations, and if manufacturers exceed these limitations not only will they not experience an increase in productivity, but they could also inadvertently sabotage their operation. Since every horizontal is different, the machine’s column and pallet interface should be evaluated to determine if it can accurately machine high and wide on the Y-axis. Another aspect manufacturers should consider is pallet design. Pallet interface is a traditional problem on some machines, but manufacturers can find machines that are designed to eliminate the potential for deflection, allowing for accurate high cuts. It’s also important to consider pallet clamping systems. 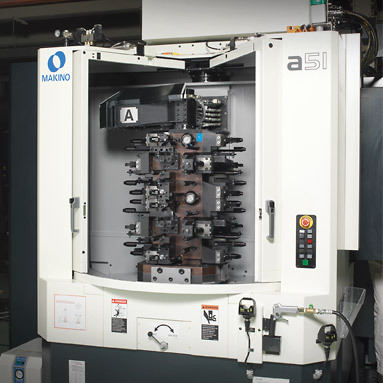 Machines like the Makino 1-Series offer clamping systems that accommodate high forces and multiple positions. Makino’s clamping systems typically have four off-center tapered cones that provide a greater mechanical advantage. This ensures the pallet is securely held down, which eliminates the potential for deflection or tipping during machining. The pitch of the cones and locators in the clamping system is also important. Typically, the larger the pitch, the better the machine will hold the pallet when pushed high and wide on the Y-axis. In addition, pallet repeatability is also important if manufacturers expect to utilize their entire work zone. As a general rule, pallets should be repeatable within a couple of tenths every cycle. Finally, for machining systems where hydraulic supply to the fixtures is required, the machine should be designed to allow for a continuous connection of this system to the workholding fixture, while refraining from infringing on the machine’s Y-axis stroke capacity. Makino’s optional Continuous Pressure Hydraulics system was designed to meet this criteria while offering continuous pressure monitoring of the clamped fixture, providing up to twelve hydraulic and/or air part seat detect lines per fixture, and an additional coolant line for internal flushing if desired. The Makino CPH system is continuously coupled without the potential for introducing either air or foreign material into the fixture that is commonly a problem amongst competing systems that only couple when the fixture is in the machine’s load position. Some horizontal machining centers have a high-risk zone in the upper Y-axis where a loss of pallet to table rigidity exits. 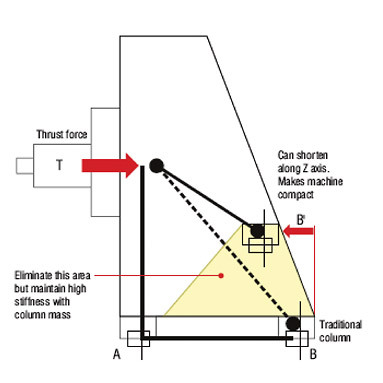 Manufacturers must understand what the allowable thrust of their machine is at different spindle positions in the Y-axis workzone, and where that thrust fore can be effectively applied. Once they determine the allowable thrust, it’s easy to understand how much allowable machining force can be applied within the work zone without compromising the pallet’s location on the machine’s B-axis table unit. This eliminates the high-risk zone and extends the safe zone. Due to their advanced kinematic design, Makino’s horizontal machining centers can apply the full Z-axis thrust available with static equilibrium, or no tipping, above the highest point of the Y-axis stroke. This means that these machines are able to machine critical features anywhere in Y-axis, because the machine is designed to be rigid well above the work zone, not just within it. This provides the freedom to utilize the entire work zone, eliminating the high-risk zone discussed earlier. Clearance above the Y-axis stroke should be another consideration. Manufacturers that want to maximize their work zone shouldn’t waste space with unneeded fixture clamps, gauges, or I-bolts, because they take up space that should be reserved for parts. Rather, these components can be placed above the Y-axis stroke, leaving the work zone clear for parts. As manufacturers add parts to their fixtures, they add complexity and cost. Machining too many or too few parts per fixture can be counterproductive. The more space in the work zone, the easier it is to access the part. This means manufacturers can use larger, more rigid tool holders and can take more aggressive cuts. This can reduce the number of passes needed to achieve the desired finish, leading to improved quality, better cutter insert life, and longer-lasting tools due to reduced vibration. Those manufacturers that don’t utilize the entire work zone often limit the number of parts they place on the fixture. In such a case, the parts are further away from each other, thus creating more distance for the cutting tool to travel. This wastes time, as the tool spends more time out of the cut. Manufacturers need to consider the tool’s ability to quickly get from part to part, having to balance the work zone and the speed of the machine. Although there isn’t a magic formula to determine how many parts should be added to a fixture, a general guideline exists. The optimum configuration point can be determined by charting the cycle time per part and the fixture cost on an X- and Y-table. The point where these intersect is the optimum configuration point. Since each fixture is different, this has to be broken down based on a particular job. Generally speaking, putting many aluminum parts up on a fixture will provide more “bang for the buck” than will be the case for cast or ductile iron parts, as tool change amortization is more critical to the overall machining efficiency when cut times are low relative to a given tool’s overall cycle time. An example of optimal fixturing can be seen in the following scenario. Using a typical horizontal machine, a diesel head can be machined on a single-station fixture. Because there are critical features on the part, is located low on the Y-axis, close to the surface of the pallet. But if this fixture is optimized and a second diesel head is placed high on the Y-axis on the same workholding fixture, it allows the manufacturer to machine two parts at once. Once manufacturers are confident they can achieve these critical features high on the Y-axis, they can greatly increase the manufacturing efficiency of each machining center. Under this scenario, the cylinder head manufacturer can also reduce the overall capital costs to produce a given number of cylinder heads per year by reducing the number of machining centers, fixtures, and tool sets required. In this example, it’s easy to see how maximizing a machine’s work zone through efficient fixturing can significantly increase productivity, decrease overall cycle times, and reduce equipment costs—as long as the equipment chosen for the project can hold this fixture density. Manufacturers are constantly looking for ways to increase productivity and gain a competitive advantage. By utilizing a horizontal machining center’s full work zone, manufacturers can reduce overall manufacturing costs and improve part quality. In an environment where many manufacturers use the same types of equipment, such as horizontal machining centers, how you use the equipment can be the most significant differentiation between an average return on investment and one that is significantly more profitable. It’s easy to see how optimizing the utilization of the machine’s work zone can have a substantial positive impact on a project’s bottom line. Those manufacturers that use horizontals to their fullest potential will be better positioned to compete in the manufacturing game. Those that don’t will struggle to keep up.